Increased during the following two decades as many states revised their sentencing laws. 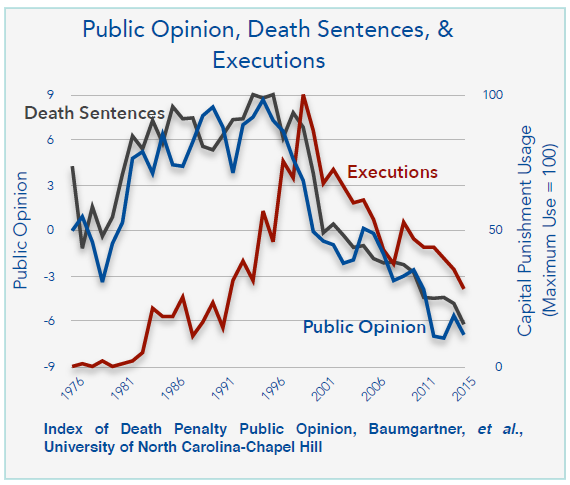 Executions increased rapidly reaching a peak of 98 during 1999. Since then, executions have dropped, reaching 28 during 2015. Meanwhile, during 2015, six death row inmates were exonerated of all charges. They were found to be not guilty of murder and released. The number of death sentences between 1976 and 2015 are shown in BLACK as a percentage of their peak value. That was 315 sentences during the year 1996. The number of executions are shown in RED as a percentage of their peak of 98 killings during 1999. Canada effectively abolished the death penalty in mid-1976 by the enactment of a single federal law, Bill C-84. Death sentences for certain offences under the National Defence Act were retained until they were also abolished in 1998. All of the southernmost row of states from California to Florida sentenced at least one person to death row during 2015, except for New Mexico. Except for Ohio and Pennsylvania, none of the remaining states sentenced anyone to death. The three states with the largest number of inmates on their death row are also among the southernmost row of states: As of 2015-JUL-01, California had 746 inmates, Florida had 400 and Texas had 265. Connecticut, Maryland, and New Mexico had previously abolished the death penalty for future cases, but still had inmates imprisoned in their death rows. The future fate of New Mexico's two inmates was argued before the New Mexico Supreme Court during 2014-OCT. 5 As of 2016-JAN-15, the Court has apparently not issued its ruling.